Two sisters in the 1950s read Charles Perrault's Bluebeard story. Barbe bleue played at the Cineworld multiplex during the Bradford International Film Festival. There was a projection problem, so the subtitles nearly fell off the bottom of the frame and I thought that the image seemed slightly squashed. Even so, the film was so beautiful that I watched quite entranced. Writer-director Catherine Breillat made her biggest splash commercially with the controversial films of her middle period, but she has always been known as a serious artist exploring feminist ideas in cinema. As a child in the 1950s she loved the short fairy tale Barbe bleue by Charles Perrault. This new film is her attempt to rework what she sees as the fascination with the story for young girls and the ideas about young women and their confidence with their sexuality. 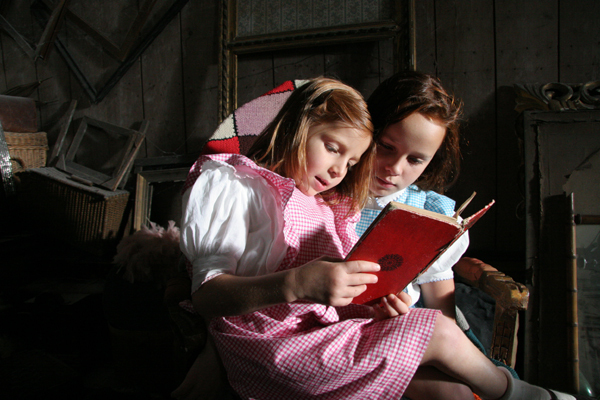 The ‘framing story’ sees two sisters as children in the 1950s playing in their attic. The younger girl is more confident and has already matched her elder and more cautious sister in educational progress. She reads the story of Bluebeard out loud almost as a goad to her sister. In Breillat’s version of the Perrault story, set some time in the late 16th century (possibly earlier), two adolescent sisters are suddenly removed from their church school because their father has been killed in the act of saving a child. Thrown into penury, the two girls and their mother have nowhere to turn until an emissary of the local aristocrat ‘Bluebeard’ arrives inviting them to a festival at his master’s castle. The younger of the two sisters recognises that Bluebeard is a lonely and isolated soul and decides to marry him despite the rumours that he has murdered previous wives. Breillat intercuts the two stories, even to the point of swapping the two younger sisters. I won’t give away the ending (of either story), but it is effective. The film is short (80 minutes) and for something that might be taken to be an ‘art film’ actually quite light and entertaining, even if relatively little happens (on the surface) and several shots are held for a long time. This certainly isn’t a comic romp or a gory melodrama – though there is blood and one or two jokes (well, we laughed in the audience). I wondered if the film had been shot digitally (the programme claimed it was a 35mm print) because the images are very sharp and clear and have that ‘coldness’ that high def video sometimes creates. This is offset by very vibrant use of colour in the costumes. I always find that European representations of the 18th century and earlier seem to work differently than those made in the UK and I can’t quite work out what the difference is. Breillat has said that she has collected many of the objets d’art that appear in the film, but it is the costumes that make the difference for me. Bluebeard and Marie-Catherine riding together after the wedding. The performances are very good and the actors are well chosen (after a long period of auditioning). The two leads, Lola Creton as Marie-Catherine and Dominique Thomas as Bluebeard, are particularly good – he a very large, but quite soft man, she a slip of a girl, very attractive and intelligent. Not sure how she’ll go down in North America – one of her most charming attributes is a set of teeth that are ‘pearly white’ but slightly mis-shapen. Breillat makes her points (i.e. imagining how an assertive young woman would overcome the expectations of people of authority in that society) with great sublety and Marie-Catherine’s attitudes towards her dead father and her husband are nicely presented. An interview with Catherine Breillat. Download the pressbook and stills from New Wave Films. The film is scheduled for UK cinema release in June/July 2010. It’s well worth catching. This entry was posted in Festivals and Conferences, Films by women, French Cinema. Bookmark the permalink.